Have you ever thought as to why do we breathe? Do plants breathe as well? It is quite obvious that we eat food to gain energy. But how is food converted/broken down in order to obtain energy? How do other organisms derive their energy from food? Do other organisms eat their food just like we do? You might be disoriented because, at first, we were talking of breathing, and now, we are discussing about food and the energy derived from it. Practically, the process of breathing happens to be connected to the processes which are aimed at the production of energy from food. Today, we will discuss the respiratory processes which occur inside the cell, and which are responsible for the release of energy. Cellular respiration refers to the process which is responsible for the breakdown of food inside the cell. The breakdown of food leads to the production of energy. The energy is utilised for the synthesis of ATP. Respiration is a process in which oxidation breaks the carbon-carbon (C-C) bonds of complex molecules; this process is accompanied by the release of energy. The molecules which are oxidised are known as respiratory substrates. A glucose molecule is the primary respiratory substrate and yields carbon-dioxide and water. Aerobic Respiration: It is the process in which the oxidation of the carbohydrate molecule, glucose, takes place in the presence of oxygen. Anaerobic Respiration: It is the process in which the oxidation of glucose takes place in the absence of oxygen. We have lungs where the exchange of gases takes place, but what about plants? How do the plants breathe? The green plants also respire. For respiration to occur, oxygen is required and carbon-dioxide is released. The plants have stomata and lenticels for the purpose of gaseous exchange. Plants are well adapted to take care of their own needs involving gaseous exchange. They do not entail a significant demand for gaseous exchange. The rate of respiration in plants is far less than the rate of respiration in animals. It is only during the process of photosynthesis that large volumes of gases are exchanged. In plants, most of the living cells are present towards the leaf surface. This also holds true for the stem in plants because the living cells are arranged in thin layers beneath the bark. The bark also has openings called lenticels; which facilitate the exchange of gases. The interior of the plants consists of dead cells; which support the plant mechanically. Moreover, the parenchyma cells in the leaves, stem, and roots of the plants are packed loosely. Due to the loose packing of the parenchyma cells, air spaces develop. The network of these air spaces is interconnected. The complete combustion of glucose is a type of aerobic respiration because energy is required. Some of the energy which is liberated as heat is used to synthesize other biomolecules. In respiration, oxidation of glucose occurs in multiple steps. The energy released is coupled with ATP synthesis; in those steps which have high energy demand. In contrast, the organisms which synthesize ATP, in case oxygen is present, and switch to fermentation in the absence of oxygen are called facultative anaerobes. The obligate aerobes are the organisms which synthesize ATP only in the presence of oxygen. The organisms which cannot tolerate oxygen and die in its presence are called obligate anaerobes. Occurs in: The cytoplasm of the cell. It does not require oxygen. The term ‘glycolysis’ is derived from Greek; where ‘glycos’ stands for ‘sugar’ and ‘lysis’ stands for ‘splitting.’ The whole pathway of glycolysis to be discovered took almost 100 years. The pathway of glycolysis was put forward by Gustav Embden, Otto Meyerhof, and J. Parnas. Glycolysis is often referred to as EMP pathway (Embden-Meyerhof-Parnas pathway). Glycolysis is the sole respiratory process in anaerobic organisms. The pathway of glycolysis involves the breakdown of glucose to pyruvic acid. Glycolysis encompasses a series of reactions; in which the 6-C (six-membered carbon compound, glucose) is split into two 3-C (three-membered carbon compound, pyruvate). This metabolic pathway involves partial oxidation of glucose. The glucose molecule which undergoes oxidation is either the end product of the process of photosynthesis or derived from storage carbohydrates. It involves a series of ten reactions which are catalysed by different enzymes. Glycolysis consists of two phases; energy-requiring phase and energy-releasing phase. Phosphofructokinase is the key regulator because it is allosterically inhibited by high levels of ATP in the liver. The enzymes, phosphofructokinase, hexokinase, and pyruvate kinase, are critical for the regulation of glycolysis. The end products include two molecules of ATP and two molecules of NADH. There are five steps in the energy-requiring phase of glycolysis. The first phase of the glycolytic pathway requires the input of the energy. Two ATPs are utilised in order to yield an unstable monosaccharide, fructose. Fructose then breaks down into two 3-C biomolecules; which are isomers of each other. The second phase of the glycolytic pathway releases energy. The two 3-C monosaccharides (dihydroxyacetone and glyceraldehyde-3-phosphate) undergo a series of reactions which finally produce pyruvate. Four ATP molecules and two NADH molecules are formed. All the reactions happen twice because a molecule glucose splits into two 3-C biomolecules. The end product, however, will be the same. The glycolytic pathway begins with a molecule of glucose and terminates with two molecules of pyruvate. A total of two molecules of pyruvate, four ATP molecules, and two NADH molecules are formed. Since two molecules of ATP are utilised during the first phase (energy-requiring phase), therefore, there is a net gain of two molecules of ATP and two molecules of NADH. The pyruvate molecules produced in the glycolytic pathway can either enter lactic acid fermentation, alcoholic fermentation, or aerobic respiration. Many prokaryotes, as well as unicellular eukaryotes, have fermentation as the primary means for producing ATP. Occurs in: The absence of oxygen (in yeast, muscle cells, etc). In fermentation, the energy from the carbohydrates, like glucose, is obtained even in the absence of oxygen. This type of anaerobic respiration occurs in some plants, fungi, and some types of bacteria. In fact, some bacteria rely solely on fermentation as the source of energy production. Even human muscle cells employ fermentation when their oxygen demand is not met. Yeasts and other organisms which undergo fermentation are employed for the production of yoghurt, bread, wine, and biofuels. The pyruvate (pyruvic acid) produced is either converted to carbon dioxide and ethanol (alcohol fermentation) or lactic acid (lactic acid fermentation). However, there is only a small amount of energy produced through either of the pathways. It is a type of anaerobic respiration which also takes place in humans. In lactic acid fermentation, the end product of glycolysis (pyruvate) is converted into lactic acid. The NADH molecule, which is formed during glycolysis, converts into NAD+. This conversion takes place because the NADH transfers its electrons to pyruvate. The pyruvate is converted into lactate (a deprotonated form of lactic acid). The NAD+ is cycled back so that glycolysis can continue. The lactic acid is transported to the liver via blood. In the liver, lactic acid is converted into pyruvate. The red blood cells (RBCs) have no mitochondria, and therefore, carry out lactic acid fermentation. You might have noticed that your legs feel sore and cramped after a workout or a race. Why does this happen? You encounter such a situation after a workout because during an exercise/workout the energy demand of your muscles rises. Since oxygen is available in less amount, therefore, the muscle cells start to carry out lactic acid fermentation for energy. Consequently, the lactic acid builds up in muscles. This may cause the muscles to feel sore and tired after a workout. It is also a type of anaerobic respiration which takes place in yeast and some bacteria. Alcoholic fermentation is, however, absent in humans. The pyruvate is converted into carbon dioxide and ethanol. The NADH molecule converts into NAD+. This conversion takes place because the NADH transfers its electrons to a derivate of pyruvate. The ethanol found in alcoholic drinks like wine and beer is derived from alcoholic fermentation carried out by yeast. It is also employed in the bakery (bread, cakes, etc). The byproduct, i.e., carbon dioxide, of alcoholic fermentation is responsible for forming bubbles in the dough. These bubbles are responsible for the dough to expand, and also, leaves holes in the dough after baking. This makes the bakery products light and fluffy. The large quantities of alcohol are harmful to yeast as well (just as they are to humans). The end product of glycolysis, pyruvate, is transported from the cytoplasm to the mitochondria. Pyruvate dehydrogenase is an enzyme which catalyses the oxidative decarboxylation of pyruvate after it enters the mitochondrial matrix. 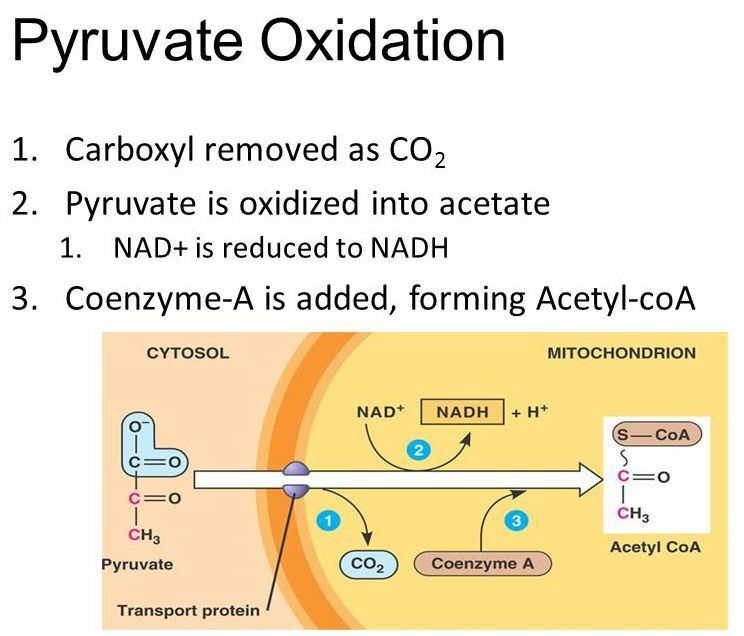 Although the oxidation of pyruvate is a short process, nonetheless, it is crucial in the cellular respiration. Pyruvate oxidation links glycolysis to Krebs cycle. The steps of pyruvate oxidation are catalysed by the enzyme complex, pyruvate dehydrogenase. Pyruvate Dehydrogenase is also responsible for the regulation of the process of pyruvate oxidation; because it supervises the amount of acetyl-CoA entering the Krebs cycle. Two molecules of NADH are produced from the oxidation of pyruvate. Occurs in: The matrix of the mitochondria in eukaryotes and cytoplasm in prokaryotes. Krebs cycle, also known as the Tricarboxylic Acid or Citric Acid Cycle, was discovered by Dr H. A. Krebs. The TCA cycle is the central component of the cellular respiration. The starting material is acetyl CoA (produced by pyruvate oxidation) and energy is harvested in the form of NADH, FADH2, and ATP. The NADH and FADH2 molecules act as electron carriers and give up the electrons to the Electron Transport Chain (ETC). The TCA cycle is also an excellent source of the storage forms of fuel, building blocks like amino acids, cholesterol, nucleotide bases, and porphyrin. The primary function of the TCA cycle is harvesting high-energy electrons from the carbon fuels. Krebs cycle involves a series of oxidation and reduction reactions. The overall rate of the cycle is determined by the overall rate of formation of the enzyme α-ketoglutarate. The TCA cycle is regulated by ATP, NADH, and enzymes, isocitrate dehydrogenase and α-ketoglutarate dehydrogenase. Two molecules of carbon-dioxide are formed in the Krebs cycle. Three molecules of NADH and a molecule of FADH2 are formed. One molecule of ATP or GTP is formed. The above results are true for one turn of the cycle. For calculating the per-glucose yield, we have to multiply the results with 2 because one molecule of glucose breaks down into two acetyl CoA molecules. The ultimate purpose of all the respiratory processes is to utilise the energy stored in NADH+ and FADH2. Now, this can only be achieved by the process of oxidation whereby the electrons are passed to oxygen, leading to the formation of water. The Electron Transport Chain (ETC) is a series of organic molecules and proteins which are present in the inner mitochondrial membrane. This metabolic pathway allows the electrons to pass through a series of carriers with the help of redox reactions. The energy is released in the form of protons which are then coupled to the biosynthesis of ATP (from ADP & inorganic phosphate), and this process is known as chemiosmosis. The chemiosmotic theory explains the process of membrane-linked ATP synthesis along with a gradient of hydrogen ions. The process of chemiosmosis was first described by Peter D. Mitchell. Oxidative Phosphorylation is the whole process of ETC coupled with chemiosmosis. The energy is released in the downhill transfer of electrons as the electrons pass from higher energy state to low energy state. The energy released is also employed to pump electrons from the mitochondrial matrix to the intermembrane space. This leads to the generation of the proton gradient. All the electrons are derived from NADH and FADH2. NADH is a good electron donor. It can transfer the electrons directly to Complex I and converts into NAD+. Energy is liberated; which pumps the protons from the matrix into the intermembrane space. FADH2 fails to donate electrons to Complex I as it is not a good donor of electrons. Therefore, the electrons are fed to Complex II and the protons are not pumped across the membrane. Both the complexes, Complex I and Complex II, pass their electrons to ubiquinone. Ubiquinone, now in the reduced state (ubiquinol), transfers the electrons to Complex III. The electrons are finally delivered to cytochrome C (Cyt C). The cytochrome C feeds the electrons to Complex IV. Water is formed by transfer of electrons to O2 by the Complex IV. Oxygen is split into two oxygen atoms which readily accept the protons from the matrix. This leads to the formation of water. How do the protons move? The complexes, Complex I, Complex III & Complex IV, are proton pumps. The complexes efficiently capture the energy and employ it to pump the protons into the intermembrane space. Also, the protons are unable to pass through the phospholipid bilayer because of the presence of the hydrophobic core of the bilayer. Therefore, these protons transport via the help of some channels which form a hydrophilic path/tunnel. In the inner mitochondrial membrane, ATP synthase acts as a channel for protons. The ATP synthase is moved/turned by the flow of the protons which are moving down their gradient. As ATP synthase moves/turns, it catalyses the addition of inorganic phosphate to ADP. The energy is captured from the proton gradient and henceforth, ATP is generated. It is responsible for the regeneration of the electron carriers. NADH and FADH2 are oxidised back into NAD+ and FAD respectively. The oxidised forms are important electron carriers in the glycolytic pathway and TCA cycle. The proton gradient, which is developed, represents a stored form of energy. The higher concentration of the protons in the intermembrane space and a lower concentration of the protons in the matrix can be used to make ATP. Now, the question comes- How many ATP are actually formed in the whole process of cellular respiration? The net gain of ATP for a molecule of glucose is around 36 ATP. However, some sources may conclude the net ATP yield to be only around 30-32. One molecule of NADH yields energy equivalent to 3 ATP whereas a molecule of FADH2 yields energy equivalent to 2 ATP molecules. Respiratory Quotient (RQ)= Volume of carbon dioxide evolved/ Volume of oxygen consumed. The RQ for carbohydrates is 1 and for fats, RQ is less than 1 (RQ<1). Proteins also have an RQ value less than 1 (RQ<1). In the pathway of respiration, only glucose is the favoured substrate. Prior to their entry in the respiratory pathway, all the carbohydrates are essentially converted into glucose. Although other types of biomolecules can also enter respiration, they need to be broken down first. Say for example; fats are catabolised into acetyl CoA, glycerol converts into PGAL, and proteins enter the pathway in the form of individual amino acids. What are we observing? We noticed that each and every biomolecule has to be broken down first and then only can it enter the respiratory pathway. Since the breakdown of compounds is clearly visible, respiration can be considered a catabolic pathway. Moreover, these substrates/compounds are also the precursors for the synthesis of various biomolecules. Fatty acids are split into acetyl CoA. In case, an organism needs to synthesize fatty acids, the acetyl CoA will be withdrawn from the respiratory pathway and employed in the biosynthesis of fatty acids. We see that respiration even aids in the biosynthesis of organic molecules. Now, we get a clear picture of the respiratory pathway. It is not only an example of catabolism but also of anabolism. Therefore, we can rightly term the respiratory pathway as an amphibolic pathway. Respiration is a process in which oxidation breaks the carbon-carbon (C-C) bonds of complex molecules; this process is accompanied by the release of energy. The pathway of glycolysis involves the breakdown of glucose to pyruvic acid. In fermentation, the energy from glucose is obtained even in the absence of oxygen. The primary function of the TCA cycle is to harvest high-energy electrons from the carbon fuels. The Electron Transport Chain (ETC) is a series of organic molecules and proteins which are present in the inner mitochondrial membrane. #1 What are the end products obtained in glycolysis? Glycolysis takes place in mitochondria. It produces 4 ATP, 4 NADH and 2 molecules of pyruvate. It is the final step of aerobic respiration. Oh, Snap! You need to read the article again and come back to this quiz.